The Federal government and Federal Reserve are trying to inflate another housing bubble to save the "too big to fail" banks from a richly deserved day of reckoning. If we want to understand why the U.S. government is doing its best to inflate another housing bubble, we must start with the Devil's Pact partnership of the government and the "too big to fail" banks. Simply put, the TBTF banks would not exist without the Federal Reserve and Federal government bailouts, subsidies and protection from transparent marked-to-market pricing of the banks' collateral and risk. The basis if this partnership is simple: the banks' enormous profits and financial power have enabled them to capture the regulatory machinery of the government (the Central State) and the political machinery controlled by its elected officials. 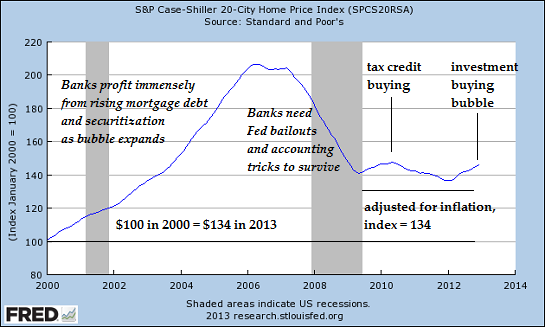 To understand the true meaning of the housing bubble, we need to understand how banks reap outsized profits. In classic capitalism, banks earn profits by maximizing the allocation of capital. In practical terms, this means lending money to low-risk, high-growth, high profit-margin enterprises, and avoiding lending to high-risk, low-margin enterprises. In the industrial era, banks reaped profits by funding large, centralized industrial corporations. In the post-industrial economy, banks began skimming huge profits from credit cards and other consumer loans. 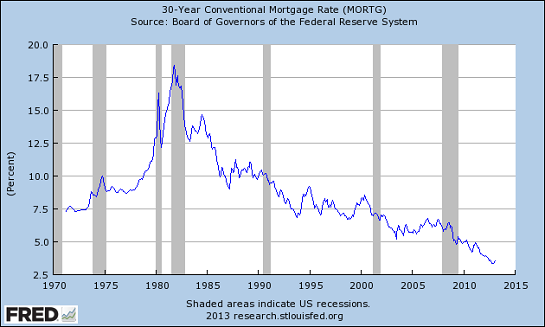 Mortgages remained a low-risk, low-yield business that operated more like a utility than an investment bank. When domestic opportunities for profit shriveled in the stagflationary 1970s, U.S. banks went international, loaning billions of dollars to South American nations at high rates of interest. The money-center banks assumed that sovereign debt (i.e. loans to governments) were low-risk. These loans generated enormous profits for the banks, until the unthinkable happened: the debtor-nations defaulted on their sovereign debt. The Federal government and the Federal Reserve had to step in and save the banks from the consequences of their faulty risk assessment and rapacious pursuit of high-risk, high-yield profits. By the 1990s, the new knowledge economy corporations had little need for bank credit. Technology companies generated so much cash, they either didn't need bank loans or if they chose to borrow money, they did so via the corporate bond market. Having already tapped almost every qualified borrower with a mortgage, auto loan or credit card, the big U.S. banks had once again run out of highly profitable markets to exploit. The government and Fed-created housing bubble handed the big banks a new market to exploit: high-yield mortgages to marginally qualified buyers guaranteed by Federal agencies (Fannie Mae, Freddie Mac, FHA, VA, etc. ), i.e. subprime mortgages. Federal agencies loosened lending standards so those who by prudent risk-management would not qualify for mortgages were now able to borrow vast sums with little or no money down, and the Fed pushed interest and mortgage rates down to lows not seen in generations in the wake of the dot-com bust of 2000. For PR purposes, this vast expansion of bank lending was sold as a high-minded extension of the "ownership society" (i.e. homeownership) to those households who had previously been denied the opportunity to become debt-serfs due to unfairly tight lending standards. In reality, the entire "ownership society" campaign masked the true intent, which was to open new and unexploited territory for the big U.S. banks to plunder. Even better (from the bankers' point of view), loosened regulations and oversight enabled banks to carve up mortgages into tranches that were then bundled into mortgage-backed securities (MBS) that could be peddled worldwide as "safe" investments for pension funds, townships, insurance companies, etc. The housing bubble enabled big banks to skim tens of billions of dollars in profits from originating mortgages to marginal buyers and securitizing mortgages into MBS. This is the heart of what I call the Neocolonial Model of Financialization: rather than make risky sovereign-debt loans to international borrowers, the big U.S. banks came home and exploited the low-risk domestic housing/mortgage market. When the bubble burst, as all speculative bubbles eventually do, the banks were rendered insolvent: their collateral (the mortgaged housing) had lost much of its value, and mortgages that had been sold as essentially risk-free were revealed as defaults waiting to happen. The Fed and Federal government immediately stepped in to save their treasured partner, the parasitic banking sector, from righteously earned destruction. The bailouts, guarantees and backstops totaled about $23 trillion, roughly 150% of the entire American Gross Domestic Product (GDP), and roughly twice the 2008 value of all U.S. residential mortgages (almost $12 trillion). 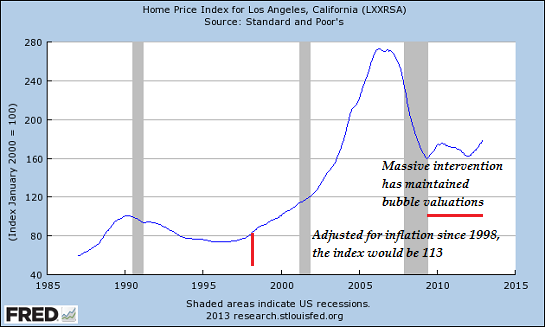 The housing index has yet to decline to an inflation-adjusted pre-bubble level: valuations are still higher than they were before the bubble. To enable the TBTF banks to once again skim billions in profits, the Federal government and Federal Reserve immediately began trying to reflate the housing bubble. Tax credits were lavished to new home buyers, mortgaged rates were driven even lower, and the Fed began buying $1+ trillion of private mortgages. The first tax-credit frenzy faded once the credits expired, but the Fed's zero-interest-rate policy (ZIRP) gave investors no choice but to put their money in risky assets: stocks, high-risk corporate bonds or residential housing. 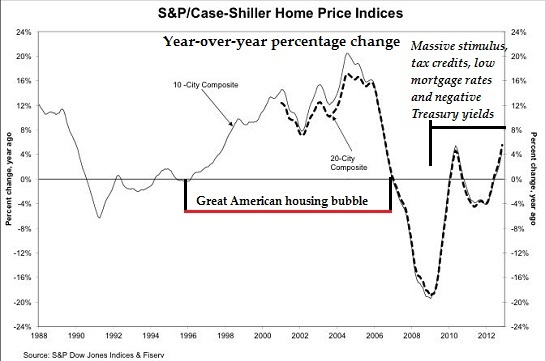 As we can see in this year-over-year percentage chart of the Case-Shiller Index, these policies have sparked another spike up in housing prices (restricting inventory played a key role in this, of course). Thanks to writeoffs and writedowns, mortgage debt has declined in recent years, but we need to remember that if pre-bubble growth trends in population and housing valuations had remained in place, total mortgage debt in the U.S. would be around $5 trillion, not $10 trillion. 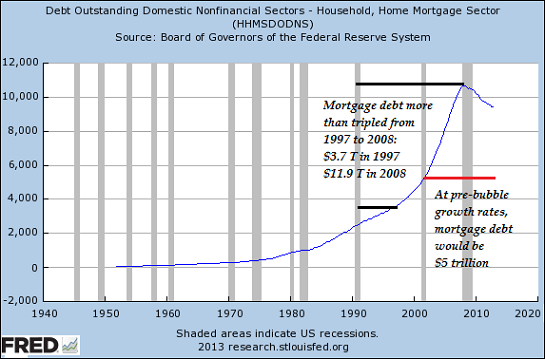 The $1 trillion writedown in mortgage debt is just the start; we only need to write down another $5 trillion to get back to a non-bubble level of debt. Meanwhile, total consumer debt has barely budged. In other words, that $1 trillion reduction in mortgage debt has been offset with rising student loans, auto loans and other consumer debt. 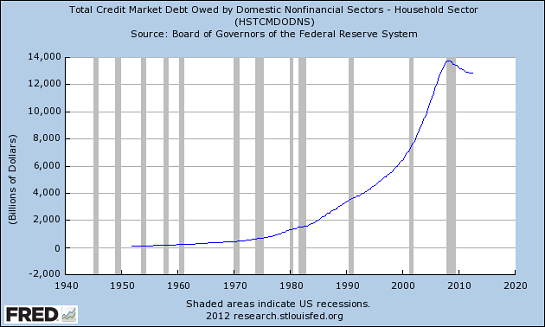 The total debt load on U.S. households remains at bubble levels, more than twice the debt owed in 2000. Population growth since 2000 accounts for 9.7% of this additional debt, meaning that if debt had risen at pre-bubble rates, total debt would be around $6.5 trillion rather than $13 trillion. Recall that adjusted income for most households has declined sharply since 2000.So the Fed's zero-interest rate policy is simply a holding action that enables over-indebted households to keep making their debt payments to the banks. Many people claim the Federal government and Federal Reserve are trying to inflate a new housing bubble to trigger a new "wealth effect," i.e. people seeing their home equity rising once again will feel encouraged to borrow and blow money like they did in 2001-2008.